Tomás Saraceno was born in 1973 in Argentina. He received a degree in Architecture from Universidad Nacional de Buenos Aires followed by postgraduate degrees in Art and Architecture from Escuela Superior de Bellas Artes de la Nación Ernesto de la Carcova in Buenos Aires in 2000 and Städelschule in Frankfurt am Main in 2003. He attended the International Space Studies Program at NASA’s Ames Research Center in 2009. That same year, he also presented a major installation at the Venice Biennale and was awarded the Calder Prize. Saraceno’s work is influenced by his architectural training and his observations of the natural world. It often mimics the scientific latticework of molecules, organic complexity of spiderwebs, neural circuits, and even soap bubbles, striving to create a theoretical utopian city of connected existence. 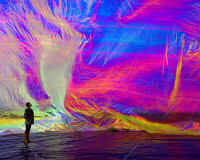 Saraceno currently lives and works in Berlin, Germany.